Do you ever think about how far your food travels to reach your table? And how much energy is required to grow, fertilize, refrigerate, package, and ship that item to you? Or that same path for each of the ingredients it takes to make that food product? And how much energy your supermarket burns through in terms of lights, AC, and refrigeration? The energy usage of growing/producing aside, you may have noticed that I have a thing about packaging. Given that there may be more plastic in our ocean than fish by 2050, we should all care. This is no longer on some future generation's lifespan. There's so much to love about the West Ashley Farmer's market: the music, the local produce, and so many delicious other foods. Plus, it's pretty nice to breathe some fresh air and meet your neighbors! Still not sold on the farmer's market? Check out these gorgeous ravioli I snagged from Rio Bertolinis! If you are still eating dried pasta that tastes like cardboard, I hope you're a broke college student. 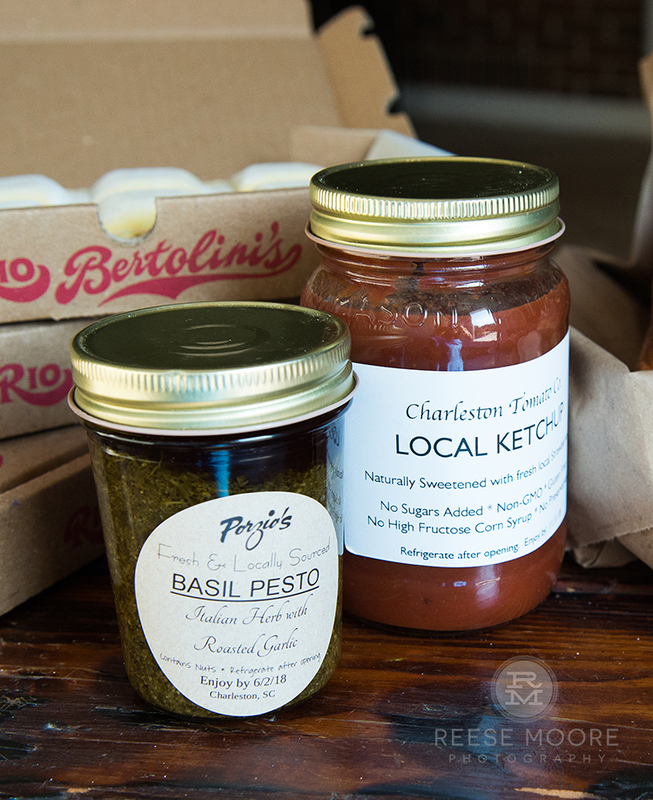 If you've realized life is too short to eat crappy carbs, welcome to team #CarbWoke, and if you live in Charleston and haven't discovered Rio Bertolini's delicious raviolis with ever-changing stuffings, we need to talk. Look at that packaging, though! My final simple packaging win at the farmer's market this week - and I by no means mean this is a comprehensive list, I'm just on a budget here - was my usual one dozen local farm fresh eggs. These are a staple in my house! And where my supermarket is awash in plastic and styrofoam, my lovely egg vendor keeps 'em nestled in cardboard. Toasted EVO semolina bread with Wishbone Heritage Farms egg (runny middle addict over here), greens from the garden, melted cheddar and Vidalia onion... with that heavenly slathering of Charleston Tomato Co. Ketchup! Queens don't eat this well, y'all... though they eat with more poise and class.